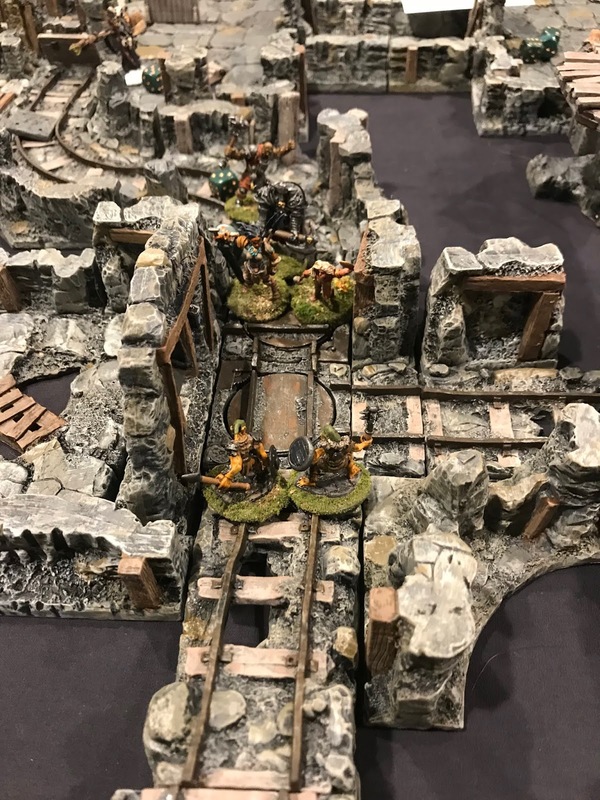 Fall-In Playtest Day: Into the Abandoned Mine… | H.A.W.K.S. Chris Palmer This past weekend we playtested a couple of of our games for the upcoming Fall-In convention that we will be running in the HAWKs room on Saturday. 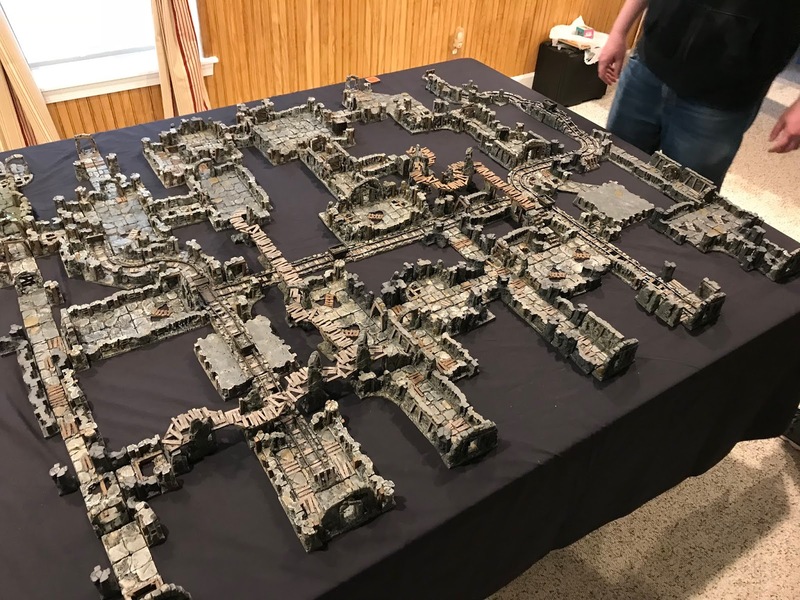 They both used all my, and Buck Surdu’s, Tablescapes Dungeon Mines terrain from the recent Kickstarter. 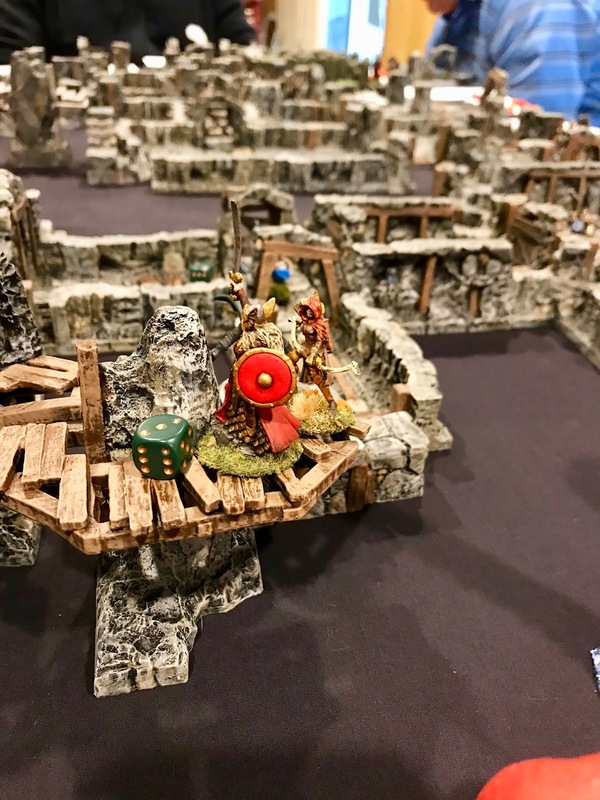 (Tablescape Dungeon: Mines) There were 5 Core Sets and a a bunch of extras in play. An overview of the set-up before the first game. I ran the first game, using the under-development Feudal Patrol rules. This was a twist of a regular Dungeon Crawl type of game, with each player controlling a conventional party of adventurers. 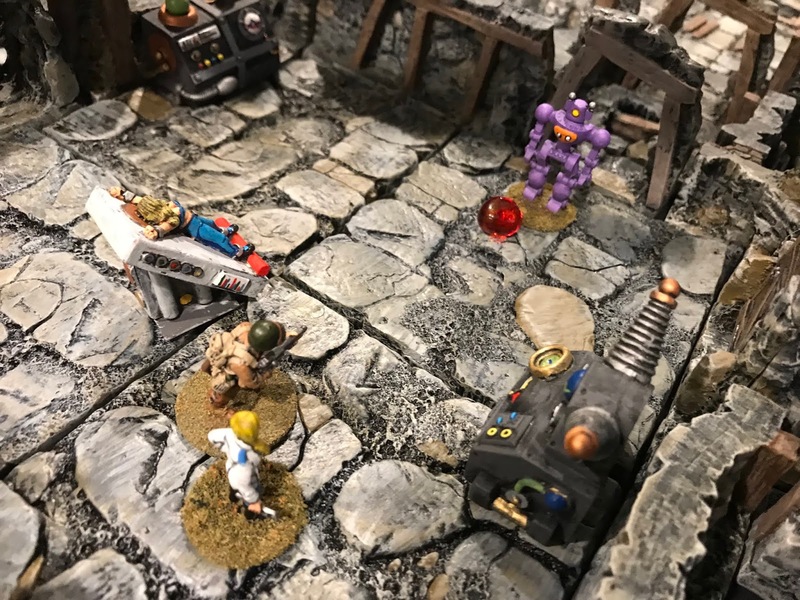 Players started with their packs full of treasure at the back of the abandoned mine dungeon, and had to make it out alive; all the while being pursued by a very big monster they have disturbed. Along the way, each player had a hand of a half dozen cards they could play on their fellow adventuring parties. These cards sprung traps, summoned monsters, and caused other mishaps to occur; all in an attempt to slow the other guys down, and make them drop the treasure they were carrying. Whoever made it out fastest with the most treasure was the winner. 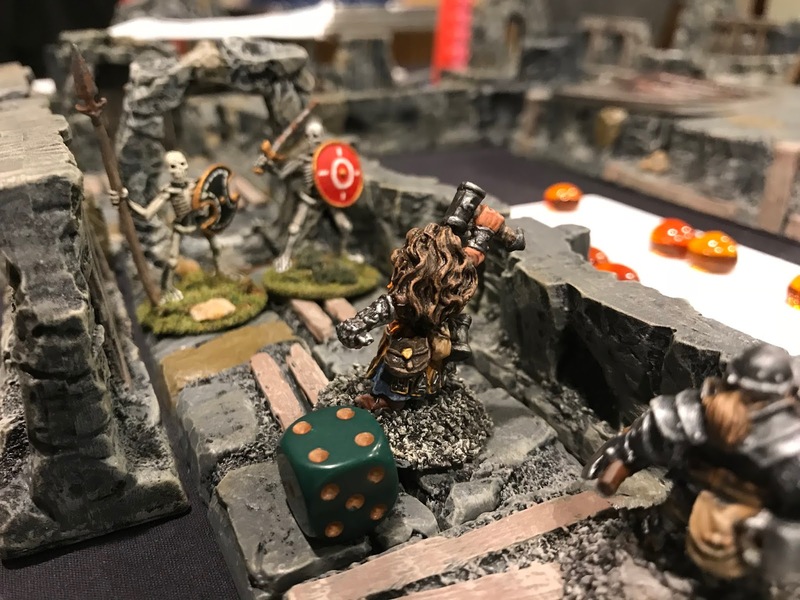 A Dwarf Cleric prepares to welcome two skeletal interlopers. A pair of Goblins block the path of the Barbarians. A group of Humans negotiate a rickety wood walkway. The second game, run by Buck, was a Weird War II outing featuring GIs investigating a secret Nazi lab hidden in an abandoned mine. The rules used were GASLIGHT. 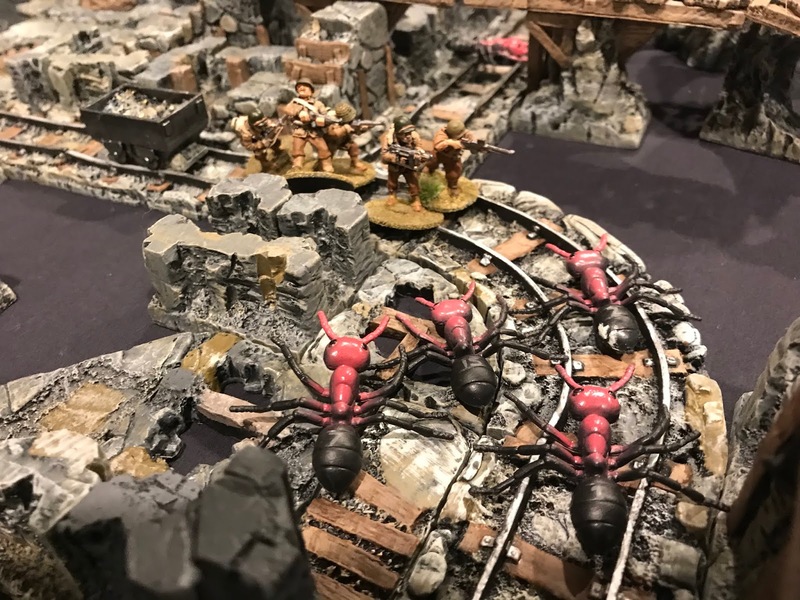 Each player commanded a squad of American soldiers, while Giant Ants, Robots, , Nazis, and all sorts of other nasties awaited them. The goal was to retrieve certain lab equipment and get it back out of the mine to safety. Like the previous game, players had a handful of cards they could play on their fellow players in an attempt to slow them down. 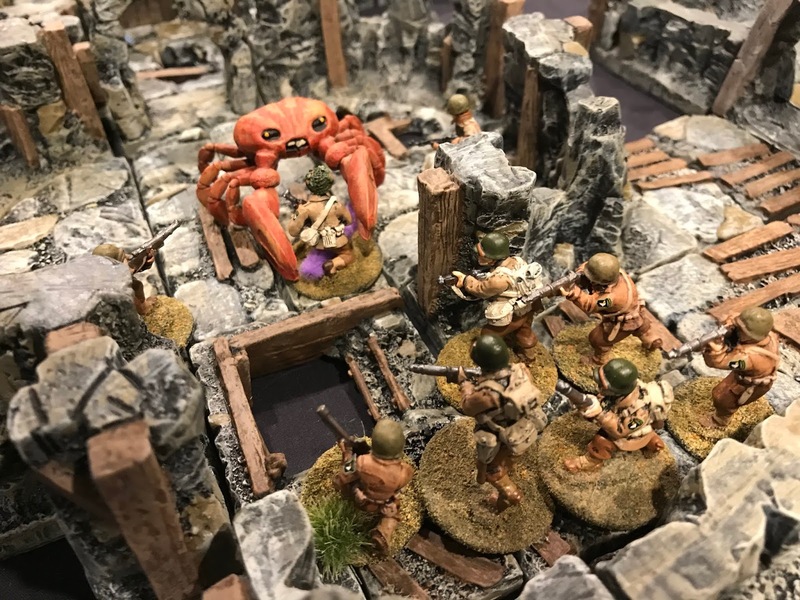 Another group of Soldiers meet a Giant Crab. A Sergeant and a rescued captive faces off against an evil Robot. Both games were a whole lot of fun with much laughter, good natured back-stabbing, and corny movie quotes. We’re really looking forward to running these on the Saturday at the convention in November. There will also be a third game in this series Saturday night, featuring Doctor Who, and helmed by Greg Priebe.